Japan coach Eddie Jones has warned Scotland that his team want to be more than "one-hit wonders" after their sensational win over South Africa at the World Cup. Karne Hesketh crossed in the final minute to win the World Cup Pool B encounter in Brighton on Saturday. The Brave Blossoms face Scotland on Wednesday in their second match. "We have two objectives: reach the quarter-finals and be team of the tournament," said Jones. "With that in mind we have made a successful start. We did not come here to be one-hit wonders." Japan, who were given a guard of honour as they left their Brighton hotel in the wake of their win over the Springboks, have had just four days to prepare for Wednesday's match. Jones has made six changes to his starting XV, with props Keita Inagaki and Hiroshi Yamashita coming in and Amanaki Mafi, who came on as a replacement against South Africa, playing from the start. Justin Ives replaces Hitoshi Ono in the second row while centre Yu Tamura and wing Kenki Fukuoka start. 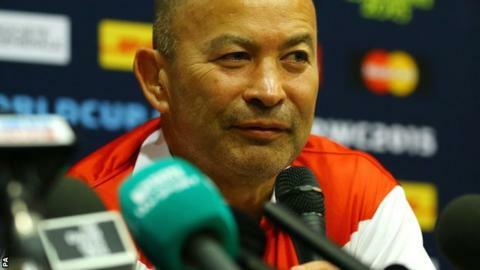 Jones has a similar game plan to that which worked against South Africa, where his side came through strongly in the dying stages. "We see the start of the game against Scotland as being super important," he added. "We've got to make sure Scotland work really hard, and score some points early in the game. "If you look at Scotland's scoring profile they are very heavily a first-half scoring team. They get outscored consistently in the second half. "If we can stick with them in the first 30 minutes, and we are in the game at half time, we will win, because we will run them off their feet." Captain Michael Leitch, who twice turned down chances to kick for goal at 32-29 against South Africa in favour of chasing the win, says his side will not be distracted by the acclaim that has come with pulling off one of the sport's greatest shocks. "Beating South Africa was a bit overwhelming, with all the media," he said. "People see you when you're walking down the street and congratulate you. That was a special experience. But we've addressed what could disrupt us in our preparation." Scotland have welcomed full-back Stuart Hogg back into their starting XV for the match after an ankle injury, while Josh Strauss, who became eligible for Scotland a day after the tournament started, is on the bench. Japan: Goromaru; Matsushima, Sa'u, Tamura, Fukuoka; Tatekawa, Tanaka; Inagaki, Horie, Yamashita, Thompson, Ives, Leitch, Broadhurst, Mafi.